Hercules Tried, But Did You? The upcoming Real Madrid defender David Mateos was banging heavily on hercules hurting FC Barcelona on the Saturday night. The truth was Hercules definitely tried, they played well, were very organised but this Barca side was too muchb for them to handle in the end. But the question in everybody's mind is whether the newly promoted recruit from Real Madrid B team was expecting too much from his senior side to keep on the tail of this exceptional Barcelona side. I have been to a particular Real Madrid blog sometimes back and it looked like they were banging heavily on Kaka's return to instill the momentum to take the quest forward. But at this moment his return looks like has done more damage than good to the side from the Capital. FC Barcelona managed to extract a sweet revenge on Hercules CF with a 3-0 victory away from home. Yes, it was yet another record night. Now we have equalled the record for most consecutive wins in La Liga. A first half goal from Pedro and two late goals from Lionel Messi gave us the 15th consecutive victory of the season. Guardiola lined up a defense consisiting of Alves, Pique, Abidal and Maxwell. The midfield as expected had Iniesta, Xavi and Busquets. The front trio was the usual one containing Villa, Messi and Pedro. Royson Drenthe was left out of starting eleven for Hercules. FC Barcelona will be travelling to Alicante for their La Liga engagement against Hercules CF. Nobody would have imagined this at the start of the campaign. Twenty match into this season, the only team which has managed to defeat this Barcelona side in the League was the newly promoted Hercules. Hercules played in the first division in the 1996-97 season last time and surprisingly they won both their encounters with FC Barcelona that season. Those defeat cost us the title to Real madrid that season. Barca will be making sure that a repeat of that does not happen this time around. Not only they will be making sure of that, but also would love to extract revenge for that minor blip at the very start of the season. But one thing is for sure, Madrid is very much expecting Hercules to do them a big favour. To make matters worse for the Capital side our flying right back, Dani Alves has been declared fit and has been included in the squad. The entire squad list is Valdés, Pinto, Alves, Adriano, Piqué, Milito, Fontàs, Abidal, Maxwell, Mascherano, Busquets, Keita, Xavi, Iniesta, Afellay, Messi, Villa, Pedro and Nolito. FC Barcelona has almost booked a place in the final of Copa Del Rey with a 5-0 thrashing of Almeria. The last time these two teams met, Almeria ended the match losing 8-0. This time around also there was not much change in the result. Messi, Pedro, Villa all got into the scoresheet for Barca. GUardiola understood the need of finishing the tie at home and he put out a very strong line-up for this match. Pinto was back as the goalkeeper as usual. Adriano, Pique, Abidal and Maxwell formed the defense infront of him. Xavi, Iniesta and Mascerano formed the midfield. Messi, Villa and Pedro fromed the front line. FC Barcelona started the second half of the season in the perfect style winning 3-0 against Racing Santander at the Camp Nou. This is FC Barcelona's 14th consecutive League victory equalling the record held by Rijkaard's Barcelona 2005-06 team. Pedro opened the scoring pretty early on the match, Messi and Iniesta completed the scoreline. Maxwell, Puyol, Abidal and Adriano made the back four. The midfield had the usual look of Xavi, Iniesta and Busquets. The front three was the usual Messi, Villa and Pedro. FC Barcelona lost their undefeated streak against the most unlikely of all opponents - Real Betis. We went in to this match on the back of our 28 consecutive undefeated match and was expecting to add one more to the list. But Real Betis had some other plans. When Guardiola said in the pre-match conference that he is going for the win, everybody thought that he was extending his usual niceties in the match. But the team he put on the field showed that victory was all he had in mind. Pique and Milito formed the centre of defense. Maxwell and Adriano occupied the flanks. The midfield had Xavi, Mascherano and Keita. The front trio had Afellay, Messi and Bojan formed an unusual front trio. The earlier match ended with Almeria winning against Deportivo and has now booked a semi-final clash against Barcelona. Almeria was thrashed 8-0 last time when we played them, but they should consider themselves in a much better form following this result and the Real Madrid result. The 5-0 victory in the first leg has made tomorrow's second leg of academic interest. But it could be pretty important for the fringe players in the side. Guardiola is expected to rest majority of his stars in the match in Sevilla. Messi who was down with flu has recovered and has made into the squad. the entire squad list is Valdés, Pinto, Adriano, Milito, Piqué, Bartra, Maxwell, Abidal, Mascherano, Keita, Sergio, Iniesta, Xavi, Afellay, Jeffren, Bojan, Messi, Villa and Pedro. Puyol has been left out as a precaution and Alves is injured and will miss this match. The surprise ommision is Thiago from the list. Everyone was expecting him to make the list to travel to Sevilla. Surprisingly only one Barca B player has been called in for this match and that is Batra. Dani Alves will miss out on footballing action for approximately 10-15 days after getting injured in the match against Malaga. Dani Alves has suffered a small tear in his right calf that would keep him out for up to a fortnight. Alves will undergo further tests this Monday, but if he misses the full 15 days, he will be unavailable for the La Liga games against Racing and Hercules and the second leg of the Betis game in the Cup, as well as the first leg of the semis if the team get through. None of those game actually terrifies us. So this becomes a very good time for Alves to get injured and get some rest. He has been playing non-stop since the start of the season and a small break should be good for season ahead. Adriano would be a decent replacement. The only problem for Adriano is that he has majorly played as a left back throughout this season. But then matches against Hercules, Real Betis and a possible clash against Almeria or Deportivo could be the perfect occasion for Adriano to make his claim for that position. FC Barcelona won their 17th consecutive win of the season with a 4-1 demolition of Malaga at the Camp Nou. By doing so we have now moved four points clear of our arch-rival Real Madrid. 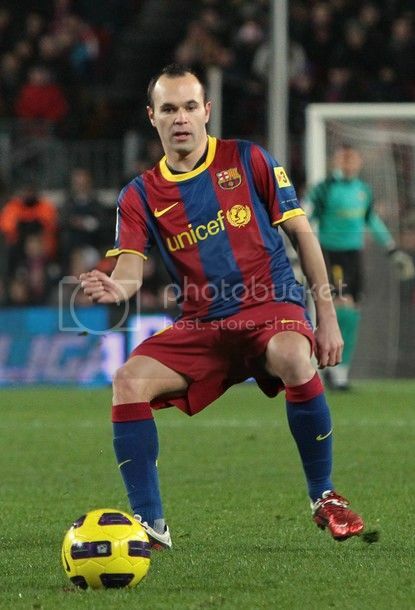 Iniesta opened the scoring followed by Villa, Pedro and again Villa to complete the tally. With a four point lead Real Madrid needs help from some of their Liga rivals if they wish to catch Barca this season. But again that very much depend on us. We went into the game knowing that real Madrid has been held to a draw by bottom placed Almeria and it was a clear chance to increase the lead on top to four points. Guarddiola lined up with Puyol, Pique, Alves and Abidal. The midfield had Xavi, Iniesta and Busquets. Messi, Pedro and Villa formed the front trio. The newly crowned FIFA-Balon D'Or World Player of Year, Lionel Messi celebrated his scuccess in grand style scoring a hat-trick in the first leg of Copa Del Rey quarter final clash against Real Betis. The scoreline would give us an impression of a very easy outing, but it wasn't that easy. Real Betis should consider themselves unlucky to have lost by a 5-0 margin. Apart from Messi Pedro and Keita scored the rest for Barca. Lionel Messi displayed his FIFA-Balon D'Or to the Camp Nou crowd in a night where three of them - Iniesta, Messi and Xavi all were honoured. We lined up with a very strong eleven with Pinto on goal, Alves, Puyol, Pique and Maxwell and in defense. Xavi, Iniesta and Busquets were in the midfield. The front trio had the usual formation of Pedro, Messi and Villa. It was clear from the line-up that Guardiola wanted the tie to end tonight and that was what his team did. In an absolutely proud night for FC Barcelona, Lionel Messi won the inaugral FIFA- Balon D'OR World Player of the Year. The award was presented by Pep Guardiola . Everyone of us expected either Xavi or Iniesta to pick it up this year, but have to admit that it finally went to the Best Player in the World. Since this award has combined both FIFA WPOY and Balon D'Or together, he has successfully defended both the individual award he won last year. Brazilian footballer Marta won The Women's World Player of the Year. This is her fifth World Player of the Year award. The Ferenc Puskas award for the most brilliant goal went to Hamit Altintop. The award was presented by the goalkeeper against whom he scored that brilliant goal. The FIFA Coach of the Year for Men's football went to Jose Mourinho. Have to admit in a World Cup Year he was a surprise pick. FC Barcelona increased the lead at the top of the table to five points with a 4-0 win at Deportivo. 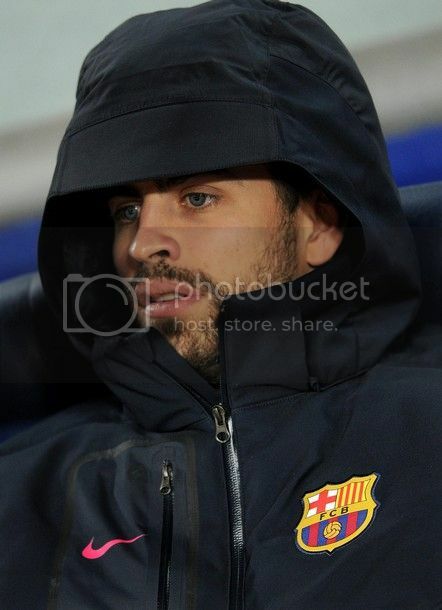 Villa, Lionel Messi, Iniesta and Pedro all got into the score sheet on a very wet and cold night. Real Madrid has teh chance to reduce the lead back to two when they face third placed Villareal tommorrow night. Guardiola brought in a number of changes in the line up from what lined up against Bilbao. Xavi started from the bench and Busquets also joined him in the sideline. Iniesta, Keita and Mascherano made up the midfield. The front trio remained unchanged with Pedro, Messi and Villa. Pique and Puyol returned back to form the usual centre defnse partnership with Abidal as left back and Adriano as Right back. This has to be the most toughest match FC Barcelona has faced till now. Yes even bigger than the Clasico. This is the first Do or Die match we have to encounter this season. The home leg of ended in a goal less draw which perfectly places this tie in the balance. To an extent we have to say that Bilbao has a slight upper hand coming into this leg. They will have the home crowd wooing for them and also San Mames in recent times has been a tough place for us to visit. FC Barcelona but will be buoyed by the fact that they have won at San Mames earlier this season. 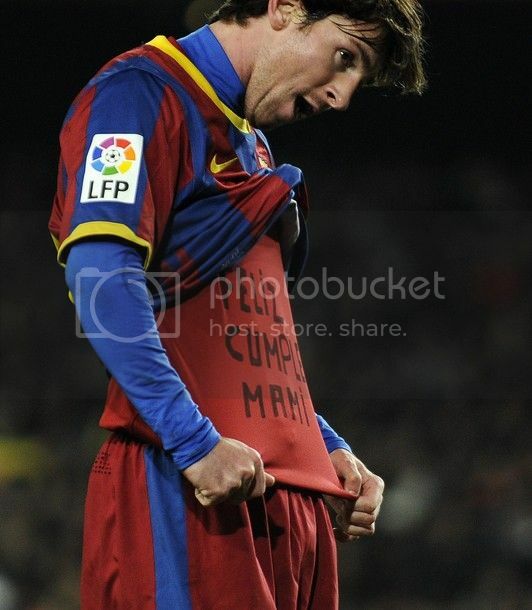 Also with Messi back in the squad we should be confident to beat Athletic Bilbao tomorrow night. 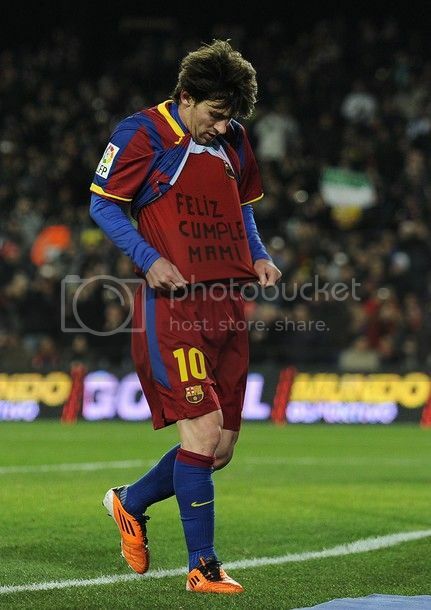 FC Barcelona started the new year 2011 with a good victory against Levante. It wasn't as easy as expected, but we managed to achieve our main objective which was the three points. Pedrito struck twice in the first half to put Barca ahead before Levante pulled one back to make way for a nervous finish. 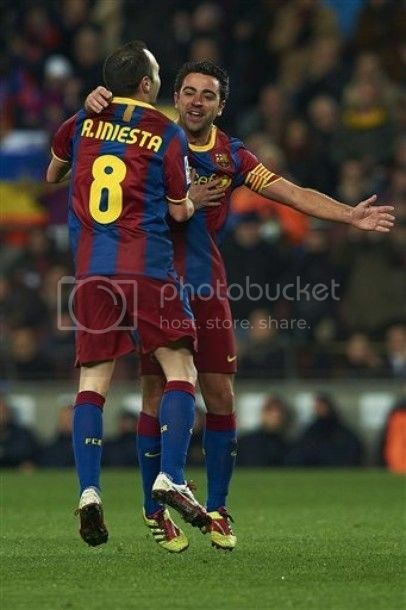 This was a special night for Xavi Hernandes who equalised the appearance record held by Migueli. Xavi made his 549th appearance for the club and had the honour of captaining the side tonight. As I wrote in the preview, Villa, Bojan and Pedro started upfront. Xavi, Iniesta and Mascherano in the midfield. The defense had Alves, Busquets, Abidal and Maxwell. I have to admit that the idea of using Sergio Busquets in centre of defense looked a bit strange. Why should not you not give Fontas or Batra or even Muniesa a start? Levante could be the perfect team to start another wonderful year in the right way. The last match Levante played was against Real Madrid in the Copa Del Rey, and that did end up with an 8-0 drubbing. 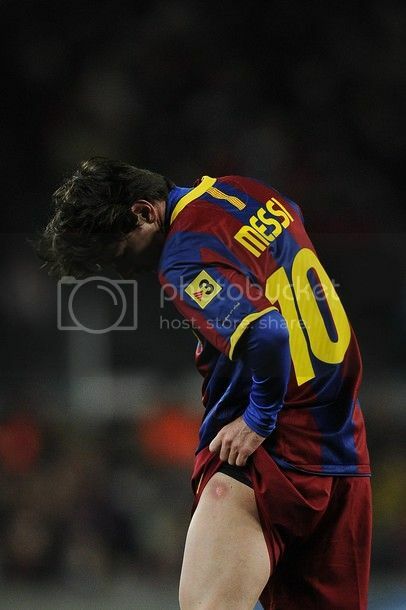 Lionel Messi is not available for this match, but I don't think that is going to bother anyone. We have most of the team available except Messi and Puyol, and Pique due to suspension. Milito and Jeffren are officially declared fit for this match. 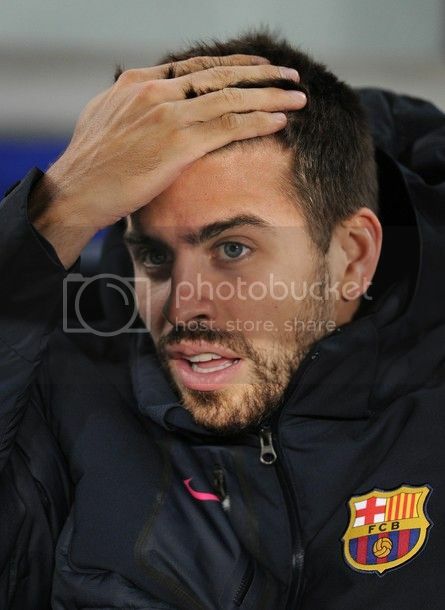 With Puyol and Pique unavaillable we have to restructure the centre of the defense. With Abidal and Milito we have a very good centre half pair, but Levante could be the perfect time to try one of those kids from the Cantera. Everyone was expecting Fontas to give some time in this match, but Batra was the one who trained with the first team. Meanwhile the new signing, Ibrahim Afellay is ineligible to debut in this match. His debut most probably will happen at San Mames. What a wonderful year this Gentleman had! It started in a rather disappointing fashion missing most of the 2009-10 season, but now it all comes down to fate. It looks like somebody up above decided to get him rested so that he can do bigger things at the biggest stage of all. Going into the world cup Iniesta was meant to play the supporting cast. No one, I mean no one in their wildest dream imagined about him scripting the biggest triumph of his nation. Spain, a perenial under achiever in footballing history was catapulted into World Cup triumph by the one of the smallest of players. Iniesta may be small but he definitely got a big tough heart. Yes, I know that's only in the soccer field. You got some doubt, ask Cristiano Ronaldo. He picked up a fight with him in his first clasico and now it looks like that was the biggest mistake of his life. Remember the Pep push stuff that happened in the clasico. Everyone remembers Valdes getting under Ronaldo's skin during that incident, but watch carefully who started it all - Andres Iniesta.